As for what happens to those children, migrant rights expert Michelle Brané told Mother Jones on Friday that frankly “we don’t know,” as the ORR “does very little to no follow-up.” In 2014, the Washington Post got a preview of what can happen to those children, as in the case of a group of minors who were given over to traffickers posing as family friends and ended up enslaved in an Ohio egg farm, where they lived in roach-infested trailers and spent their days debeaking chickens and cleaning the pens. Wagner said that in 2017, 40,810 children were referred to ORR from the Department of Homeland Security, but the largest permanent shelter capacity has 9,800 beds. 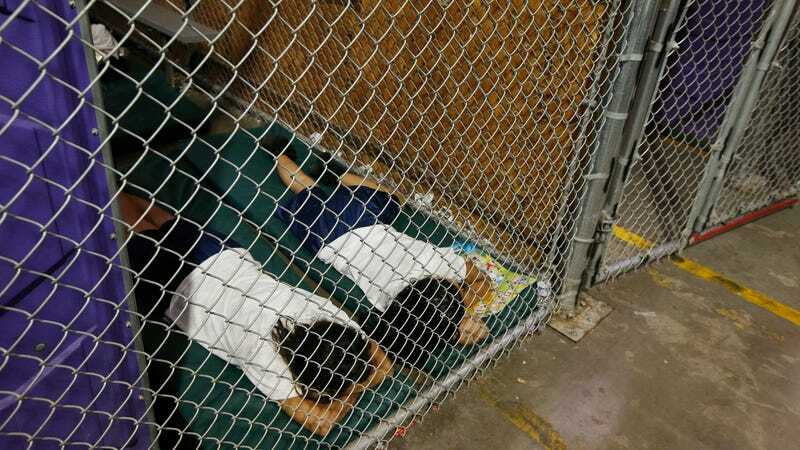 Photos show children in cages and sleeping under mylar. Jezebel has reached out to the Department of Health and Human Services for comment and will update the post if we hear back. Ivanka posted a nice photo. This is a federal agency which placed kids, in most cases, with their own families; that doesn’t mean that every placement is terrific. But the most likely case is that these are undocumented families, and they don’t want contact with the federal government. And you don’t necessarily want HHS tracking these families after they’ve placed their kids because, look, in this administration, you can’t necessarily rely upon the authorities not to be using whatever contact they have for purposes of immigration enforcement. The assertion that unaccompanied alien children (UAC) are ‘lost’ is completely false. This is a classic example of the adage ‘No good deed goes unpunished.’ The Office of Refugee Resettlement (ORR), which is part of the Administration for Children and Families at the U.S. Department of Health and Human Services (HHS), began voluntarily making calls in 2016 as a 30-day follow-up on the release of UAC to make sure that UAC and their sponsors did not require additional services. This additional step, which is not required and was not done previously, is now being used to confuse and spread misinformation. The tracking of UAC after release is just one of the recent headlines that focus on the symptoms of our broken immigration system while ignoring its fundamental flaws. President Trump’s administration has been calling on Congress to put an end to dangerous loopholes in U.S. immigration laws like the practice of ‘catch and release,’ in which federal authorities release illegal immigrants to await hearings for which few show up. In the worst cases, these loopholes are being exploited by human traffickers and violent gangs like MS-13. Until these laws are fixed, the American taxpayer is paying the bill for costly programs that aggravate the problem and put children in dangerous situations.